When you go on holiday most of us return with some left over currency that we have not managed to spend. However hard we try there are always a few foreign coins that manage to end up not being spent. The problem is that banks and bureau de change operations will not exchange foreign coins or any leftover currency back into cash. The reason that the banks won’t change foreign coins is because of the exceptionally large costs associated with counting, sorting and shipping the coins back to their country of origin before their value can be realised. However, there is a great way to change your leftover currency and coins…. use our currency exchange service here at Cash 4 Coins. We are the UK’s most trusted foreign exchange company specialising in left over currency conversion. We have helped countless customers to make the most of their currency and we could do the same for you. Whether you have a jar full of Euro coins or you have British coins you want to change to USD, we can help you to exchange your leftover currency for cash! It couldn’t be easier. Package up your left over coins and currency and send them to us here at Cash 4 Coins. If you have over a certain weight you can use our drop off service or alternatively we may collect for FREE. Check out or page ‘How to send us coins‘ for full details. We count and sort the left over currency and then make you an offer to buy them. If you accept our offer then we pay you! It’s really that simple. You can check out just how good our service is by what our customers say about our service. Go to our ‘customer comments’ page. We provide a fast, efficient and friendly service for a wide range of customers from private individuals to schools, hospitals and businesses who want to exchange their left over currency into usable cash. You can trust us to give you the best possible service and we can even collect your coins for FREE if they are over a certain weight. We are the company that likes to say Yes when it comes to exchanging leftover currency and our team is on hand right now to help. In particular, many charities and fundraisers use our services to generate much needed funds for their chosen course. We have a specialist team that are dedicated to charities so why not give us a call and change your left over currency into cash today. If you want some fundraising ideas, give our team a call. Turning leftover currency into Sterling has never been easier and you will be surprised how much those foreign coins and notes can be worth. 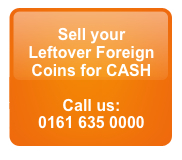 Don’t let leftover currency go to waste when Cash4Coins can exchange it for you. Our team is waiting to accept your coins now and we will even sort and count them for you. It really has never been easier to make the most of your money!